Author Dwayne J. Torres aims to inspire and revitalize individuals with his innovative blend of poetry, by creating a daily devotional of spiritual enlightenment and motivation. With his new book, "Inspirationally Redeemed," Dwayne J. Torres delivers a poetic approach that can be applied within your day to day growth and success. Dallas, TX, March 08, 2019 --(PR.com)-- Dwayne J. Torres, author of "Inspirationally Redeemed" explains in detail what inspired him to create a book that focused primarily on relationships, and self love. "I have been writing poetry all my life. And as a young man, I would express myself often in the form of demonstrating what my views were on love and pain. However, over the years and the steady growth of social media, I felt the need to deliver a message that could correlate to any form of livelihood. A daily devotional of poetry that can be applied to anyone, and used as an instrument of hope." The author expressed his views regarding the topics he feels the book touches on. "'Inspirationally Redeemed' is about the way we feel as men. It is about the way a woman should be treated by men. And it is the foundation of how the reality of relationships and life, impacts the way we treat each other as human beings. In this collection of poetry, it inspires the true king and queen in all of us." In the poetry book, "Inspirationally Redeemed," it focuses on the fabric of human emotions. Illustrating the needs and desires of their most challenging moments. It takes within those myriads of feelings and gives to the reader a translation of change. A message of positive thinking that will elevate your inner man/woman. Author Dwayne J. Torres explains why he believes his book will change lives. "'Inspirationally Redeemed' will appeal to everyone, because of what the core message represents. It inspires a man to become greater than he was before. It encourages a woman to redefine herself as royalty, and elevates her self-respect. It gives to the people a reminder that genuine love is developed from within." 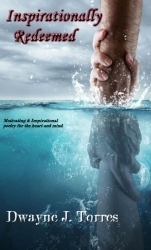 "Inspirationally Redeemed" is a collection of inspiring poetry that can be used in today’s society, and applied to any given situation an individual may be currently going through. It is a daily devotional that can be utilized for pleasure, a reference when in pain, a guide for relationships, and a tool for the peace of mind and spirit. The author, Dwayne J. Torres, also went on to share his thoughts regarding why he believes his book will set the standard for the world of poetry and motivation. "'Inspirationally Redeemed' is not just a book of poems. It is a collection of empowerment and spiritual growth, designed to enrich and motivate you in your everyday life. It will uplift you, and help rediscover the true meaning of being in touch with your mind, body, soul and God. I want my readers to take these words and adapt them, into the way they view relationships and life. I want my poetry to not only inspire, but give to someone the desire to become more. I want my words to reach within every heart, and give it a reason to trust itself again." The author of "Inspirationally Redeemed" also gave details on his experiences, and how he became familiar with the topics he addresses within the book. "'Inspirationally Redeemed' was a project born of love and pain. I have learned over the years that my struggle was not the lesson. It was the journey and the choices I made to begin my healing, that created my testimony. I took from my experiences and delivered them into a language of hope, that translated into the book of poems I created today. The message is one that I believe will change the lives of everyone who reads it." The author shared a particular quote from his book of poetry that he uses as a guide in his own daily life, and hopes to encourage others to follow as well. "Everyone wants to hear something great from the one they love. Even if they know it already, or have heard it before. Hearing it spoken aloud, makes all the difference in the world." As an ordained minister, Dwayne J. Torres has a ministry of love and support throughout the community. He has a practical approach that allows his message to reach people from all backgrounds. His unique way of speaking to the people, has a wonderful blend of love and understanding, making individuals feel comfortable to come as they are, with no judgement, and no restrictions. He uses his gifts to help those that are searching for spiritual guidance, and takes special interest in all those that he opens his door to. Author Dwayne J. Torres also has over 20 years of marketing and public relations experience. His knowledge of personal mentor-ship and motivational speaking has been an asset in helping families and individuals. As an insurance broker and ordained minister, Dwayne has taken his passion for helping people to promote the services of personal Insurance through various media outlets and community centers. His expertise as a Licensed Broker and a motivational speaker, go hand in hand with the excellent service he provides to the people he helps every day. He combines his ministry with his knowledge of insurance to bring to the community a new voice that will make a difference today. With his first published book of inspirational poetry, Dwayne J. Torres aspires to touch the souls and hearts of the broken and confused. And give a message of love that will leave the presence of God with all who encounters it. His motivational words of truth and wisdom will not only inspire, it will change and uplift the lives who thirst for the knowledge that comes from within the spirit. "Inspirationally Redeemed" is the first book of many more to come by the author. To find out more about Dwayne J. Torres and his upcoming books of inspiration, visit the publishing website for more information.